What does hospitality look like? 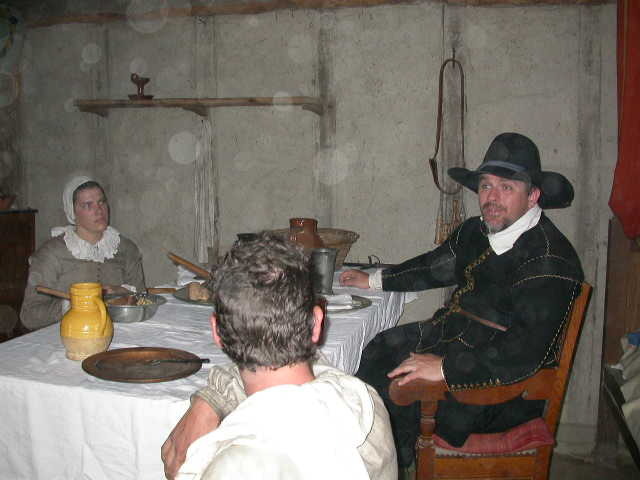 This photograph was taken in 2002, but it depicts a meal in 1627. This marvel of time-travel is made possible by Plimoth Plantation, a museum that recreates the settlement established by the people who came to North America on the Mayflower and other ships. Houses were among the first structures built. These timber-framed plastered buildings followed models known from England. The houses were furnished both with imported goods and things the colonists made themselves, like furniture, ceramics and textiles. In the photograph, a 21st-century man sits down at table with a colonist and his wife. At Plimoth Plantation it is always 1627, because the museum has chosen to recreate that year. When you visit, you see crops grown as they were in 1627, you see the carpentry methods, charcoal making, cooking, weaving, etc etc etc. And, the people wearing the clothing of a 1627 agricultural village speak English with the vocabulary, diction and cadence of 1627. When you enter their houses, they offer hospitality and conversation. It’s all based upon extensive research. But can we ever truly know the past? Can a fiction get at truth? I think Plimoth Plantation is a bold enterprise in depicting domesticity.